For some reason, there are certain to me that are quintessential New England. Sort of like those things you have to do or have when you're up here. For example, when in New Hampshire, go to the white mountains. When in Vermont, go see Ben and Jerry's. Well, when in Maine, I always always have to have blueberry pancakes. I'm so not a pancake person; give me waffles or an omelet or a bagel anyday. But put me in Maine, and bam. I want need blueberry pancakes. So what's a girl to do? Ummm find a bomb recipe and make it herself. 1. Preheat electric griddle or frying pan to medium high heat. Stir first six ingredients until well blended. Gently fold in the blueberries. 2. Use 1/4 cup measure to scoop and pour pancakes onto the hot greased griddle. Cook until little bubbles start to form around the edges of the pancake. Check to see if bottoms are golden brown and then flip. Cook until opposite side is golden brown. 1. In a saucepan, combine sugar and cornstarch. Gradually stir in water. Add blueberries, bring to a boil over medium heat, stirring constantly. Boil for about 3 minutes, stirring occasionally. Serve alongside pancakes. Yummy! 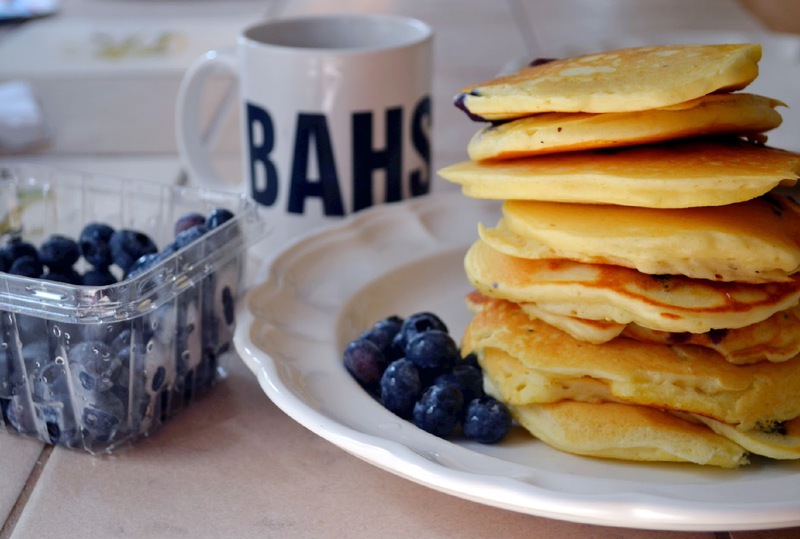 There's nothing better than blueberry pancakes :) These look delicious! I could eat pancakes for any meal, these look tasty. Nice way to use up some extra blueberries-yum! Looks absolutely wonderful. I'm loving that sauce! There is nothing quite like blueberry pancakes to start your day! Oh yum! If you are going to make the blueberry pancakes, then you might as well make the sauce! I adore pancakes for any meal! Looks wonderful! Oh this made me miss Maine so badly! I love it there, and I always do blueberries when I visit too. Thank you for sharing this sweetness. You and your words make me smile. I hope you are having a happy end to your week. I'm looking forward to a weekend of reading...back in school already! The blueberry sauce absolutely makes these! They sounds so delicious and comforting!